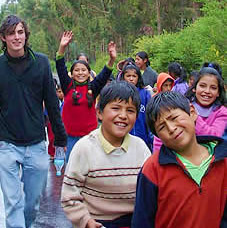 Becoming a volunteer in South America is an exciting and rewarding experience that will change your life. Prepare before you travel by researching each of the Latin American countries that you are interested in doing volunteer work in. Some specialize in certain types of volunteer jobs more so than others so it is important to be informed. We offer environmental and marine biology work in countries like Costa Rica and Ecuador, whereas other countries like Peru and Argentina for example tend to focus more on social work such as health care, teaching English abroad, or, building maintenance in communities. Of course, all countries in Latin America do focus on social work. Depending on the type of work you want to do will certainly influence which country in Latin American you end up travelling to. We are very excited to introduce you to South America and our volunteer opportunities. VOLUNTEERWORK LATINAMERICA has many years of experience organizing not only volunteer programs but also all the other services you might need to make the most out of your stay, such as accommodation, Spanish classes, excursions, airport transfers. Everything will be organized and taken care of up to the tiniest detail so that you can be worry free as you set sail for your trip! Cultural volunteer opportunities will provide you with insight into various types of community projects throughout different cities and regions in South and Latin America. Not only will you have the opportunity to make a difference within the community, but you will also have the opportunity to learn from the local people about their customs, culture and traditions. In poorer countries ecological conservation often takes a back seat to other developmental issues. Working as a conservation volunteer you will have the opportunity to make a great difference for the local people, wildlife and conservation organizations where others otherwise can't. The benefits education volunteers provide are incalculable. Firstly, providing children and adults in remote and urban communities with a basic education is invaluable to the development of the community. Moreover, teaching English abroad in tourism based areas contributes to the economic prosperity of the region. As a health sector volunteer you will become familiar with the challenges faced within the diverse health care systems of South America. Many health care organizations are under-funded and benefit from both physical help and knowledge of foreign doctors and nurses. The extra help from volunteers is greatly appreciated by both the care givers and patients alike. Social volunteering projects can be quite varied. As a social project volunteer you can expect to work with children and adults alike in either remote or urban communities. Gain valuable life and work experience through internships abroad in South America. Work alongside international professionals in various sectors including NGOs, tourism, environmental conservation and privately owned companies.